Kincannon is not alone. Religious leaders across the country are increasingly concerned about new immigration policies that have “taken the shackles off” ICE agents, in the words of White House Press Secretary Sean Spicer. Of course, large numbers of undocumented immigrants were deported under the Obama administration. But Obama-era guidelines focused ICE on serious criminals and gang members; this directive appears to be vanishing under President Donald Trump. According to news reports from several states, people with no criminal history or with misdemeanor convictions are now being swept up in ICE raids. Houses of worship are pushing back by declaring themselves “sanctuary churches” — an act of conscience that many sanctuary activists believe is rooted in biblical admonitions to “welcome the stranger.” At various times in American history, churches have given sanctuary to the vulnerable, most famously harboring fugitive slaves as part of the Underground Railroad in the 19th century. In the 1980s, many churches gave sanctuary to Central American refugees fleeing civil conflict. According to USA Today, there are now more than 800 sanctuary houses of worship in 45 states, a number that spiked dramatically after the presidential election. To be clear, religious and civic leaders like Kincannon and Hancock are not arguing that the government turn a blind eye to the presence of more than 11 million undocumented people in the U.S. Nor do they oppose ICE taking action against people who have committed serious crimes and endanger the community. But sanctuary leaders are standing up for undocumented people who they believe have been betrayed by a government that has long refused to fix the problem, and big business that has long profited from the labor of undocumented migrants. Instead of taking responsibility for creating and sustaining a broken immigration system, many Americans now demand mass deportation and unworkable walls. For the sanctuary movement, this is a classic case of blaming the victim. Against this backdrop of dysfunction, hundreds of religious individuals and communities involved in the sanctuary movement see their actions as acts of religious conscience protected by the First Amendment. For many Christians, protecting the vulnerable is more than social justice; it is a command of the Gospel. Thus far, however, the religious freedom defense has not prevailed in the courts. Under current law, ICE may enter places of worship to arrest undocumented people. And religious leaders themselves risk being charged with harboring people not authorized to be in the U.S. Exactly which actions by religious leaders could violate the law is murky, given that lower courts differ on whether “harboring” means concealment or simple sheltering. But we do know that religious clergy and laypeople were arrested and convicted for their work in the sanctuary movement in the 1980s. 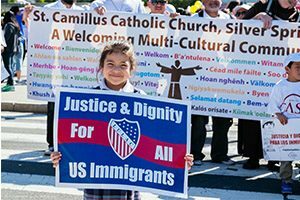 Since the law may not protect them, churches and other places of worship must rely on public opinion and moral suasion to keep ICE agents from entering their sanctuaries. The ICE “sensitive areas” guidelines are an acknowledgment that the optics of raiding churches would be morally repugnant — and a public relations nightmare. But if houses of worship become fair game for ICE under Trump — which is precisely what Pastor Kincannon fears — the only recourse for many people of faith is civil disobedience through nonviolent resistance. Civil disobedience is not, of course, one of the five freedoms guaranteed by the First Amendment. But a sixth freedom — the act of following the dictates of conscience in pursuit of justice — has been at the heart of social justice movements throughout American history. From the Underground Railroad to the women’s suffrage movement, from the civil rights movement to ACT UP, courageous Americans have defied what they believed were unjust government laws and policies — and willingly accepted the consequences, including physical assault, arrest and incarceration. “Welcoming the stranger” in the current climate requires courage and carries risk. But in the face of injustice, the voice of conscience cannot be denied. This entry was posted in Inside the First Amendment, News and tagged civil rights, First Amendment, Religion, Religion Commentary, religious freedom, Religious Freedom Center by Charles C. Haynes. Bookmark the permalink. Is it in the best interest of justice to disobey federal immigration laws?